Do you remember those stories that begin “Once upon a time…” and end with “…and they lived happily ever after”? 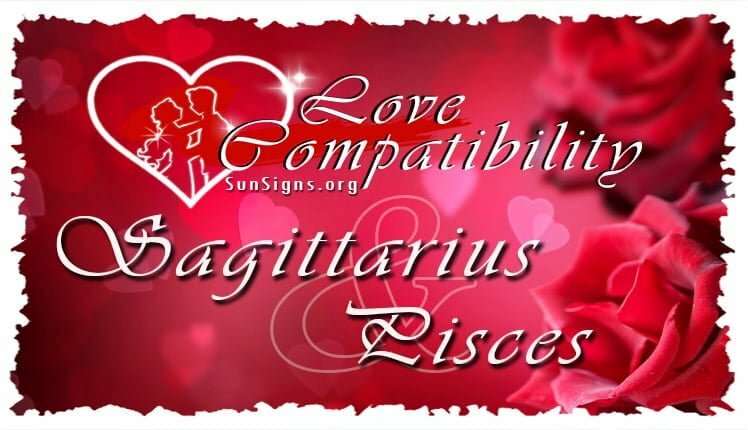 The writers of those tales were talking about a Pisces and Sagittarius love compatibility! Both these signs are mutable signs and dreamy in their own way, Sagittarius with ideas, and Pisces for his or her heart. That’s not to say the Sagittarian doesn’t have a big heart, they have one of the biggest in the zodiac. But it’s their big ideas, big attitude and joie de vivre that captures the Piscean’s heart like a fairy tale romance. But, watch out! Take precaution to continue the fairy tale, even after the honeymoon has ended. Many of the qualities that once attracted you both, may be your undoing, if you’re not careful in this Sagittarius Pisces relationship!! A Sagittarius and Pisces compatibility works like the yin and yang symbol – the two complement each other’s strengths and bolster each others weaknesses in such a symbiotic way, it’s often thought of as fate. Sagittarius is someone who will protect our sensitive and intuitive little fish. And Pisces will work tirelessly to make the Archer’s life warm and comfortable, so he or she can continue dreaming, traveling, and living large. In many ways, the Sagittarius personality is a gentle giant amongst people. Like their fiery cousins, Leo and Aries, Sagittarius has a big personality, a big persona and an even bigger heart. They love to travel and have friends in every city they visit. This is good news for sensitive fish! Pisces loves being in a relationship with someone they can look up to, someone big and strong that they can lean on, and Sagittarius is definitely that. Their larger than life persona is just the thing to make this fish feel safe! And Pisces is just the person to make their larger than life, free-spirited soul feel cared for! If the Pisces personality loves you, they will want to make your world as comfortable as possible, and they do so by intuitively watching for what you need. You won’t need to ask for a glass of water, your Pisces lover will already know you’re thirsty. This is great news for Sagittarius, who loathes the banal work of the repetitive duties that are required for a comfortable, happy home. And if you crave the spotlight Sagittarius (And I know you do!! ), that’s okay with your adoring lover. They don’t need attention from the crowd; they only desire your attention in a Sagittarius Pisces marriage. And the bedroom is one of those places where Pisces needs their Sagittarius lover’s attention who is ready to deliver. Both Sagittarius and Pisces in bed are sexual and tactile lovers, always looking to please their lover through sensuous touch, always ready for snuggling afterwards. This Sagittarius and Pisces compatibility is very healing and soothing for both the star signs, who thrive on physical contact from their lover. There is a level of wholesomeness and sweetness to their caresses in this zodiac compatibility. But don’t let that fool you! Just beneath the surface of that sweetness is a bottomless well of passion that will likely never dry up! In many ways, the Sagittarius Pisces love compatibility is the type of match that fairy tales are written about, that perfect link that fits you like a puzzle piece. So Sagittarius, if you desire a lover who adores you and will pave the way for your dreams, making your life warm and snug, choose a Pisces partner. And Pisces, if you need someone who will shelter you from the storm, whose experience and life is as big as his or her heart, choose a Sagittarius partner. In a Sagittarius Pisces friendship there can be arguments and conflicts. This happens because Sagittarius men or Sagittarius women speak without thinking at times. This can be hurtful and insensitive. Unfortunately, both Pisces men and Pisces women are very sensitive when they are spoken to rudely. Sometimes, the archer is so blunt; it drives our little fish to tears. There’s also the question of flighty Sagittarian’s memory…or lack there of. The Sagittarius man in love or Sagittarius woman in love will tend to forget birthdays and anniversaries. They will need to put an alarm to remember these days and have no romantic plans whatsoever. They believe their charm is enough to woo their partner. But this does not go down well their partner. Sensitive Pisces won’t want a belated gift—it’s not about the extravagance, but the thought and the day for the fish. Pisces women don’t want flowers next week. They want them on time, on that specific day. No questions asked. The archer’s flirty nature send the Pisces lover into a tailspin. The Pisces born has a few more of his or her own problems; they have a long fuse and can’t manage their emotions or take responsibility for their actions. They tend to blame others for what might be their own doing. They might not do so openly but keep it hidden underneath a happy exterior. This makes life very unpleasant and sooner or later for the Sagittarius Pisces soulmates. The archer is likely to explode in one of his or her thoughtless outbursts sometime soon. Or the worst scenario of a Sagittarius dating Pisces is when the fish allows his or her personality to be controlled by their lover. And, as much as he or she loves their Pisces partner, this is the Sagittarian’s blind spot. They will lap up the adoration, without knowing that this is a symptom of a dysfunctional relationship or leading to a Sagittarius Pisces breakup. So Sagittarius, be mindful of Pisces’ boundaries, think before you speak and, for goodness sake, mark your calendar! Forgetting a birthday or anniversary hurts your Pisces so! You don’t need extravagant gifts, just a reminder that your little fish is remembered. And Pisces, you must draw your boundaries clearly for Sagittarius, who is often too busy dreaming to even see them. Don’t let yourself sink into his or her personality. Just because you’re quieter, doesn’t mean you’re less important! Archer, your lesson in this Sagittarius Pisces love compatibility is to be more mindful of your Pisces prince or princess. And Pisces your quieter personality is just as important, maybe more so! The one who cares for those they love behind the scenes has an important role indeed! Remember this and you will find a love match that seems fated by the stars. The Sagittarius Pisces in love will live “happily ever after” for a lifetime.